I’m feeling very overwhelmed, blessed and ridiculously pleased… so much so that I haven’t blogged via Dearest Someone, because I’ve been busy responding to everyone via Twitter and Facebook! 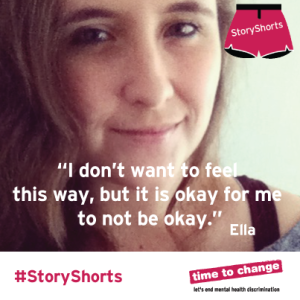 On Friday (17th July 2015) Time to Change, the national campaign to end mental health discrimination published a post that I’d written specially for their #StoryShorts campaign. Getting involved with Time to Change wasn’t a tricky decision at all, I feel very strongly about the work they do, and have often sought information from the campaign – and I regularly keep up to date with the blogs! !